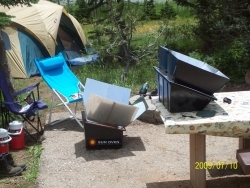 Five Million Solar Cookers in Five years, in use throughout the United States. Join our nationwide campaign and participate in a growing movement of individuals and families throughout our country who are successfully harnessing the Free Power of the Sun to solar cook their meals every day. Imagine Five Million New Solar Cookers within Five years in the United States, being used to cook five million meals in as many households. That is our ambitious goal here at Solar Cooker at Cantinawest Fa along with numerous other solar cooking groups, organizations, and solar cooker producers such as Sacramento, California based Solar Cookers International, Sun Ovens International, The Solar Oven Society, Solar Household Energy Inc., One Earth Designs, Jewish World Watch, Rotary International, and many others who are a part of this great effort. Why the need for solar cookers? Five million solar cookers sounds like a lot to some people and to others it sounds like very few when you consider how many people now live in the United States and how much energy we consume as a nation. There are over 313 million people that call the United States Home and only roughly four hundred thousand (400,000) of these people currently own or even use a solar cooker in this country. 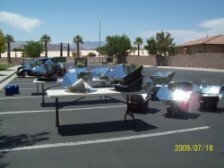 All of us at our respective solar cooking organizations feel that, ideally, we should have fifty million solar cookers being used throughout the USA on a daily basis… but five million new solar cookers in five years is a reasonable and attainable goal, and we are going to work hard to attain it. There are many who would ask why we would even have need to use solar cookers here in such a technologically advanced country as ours, and I would respond that this is exactly one of the primary reasons, of several, as to why we should be using more solar cookers in the USA. We have the technology to do so easily and in a big way. 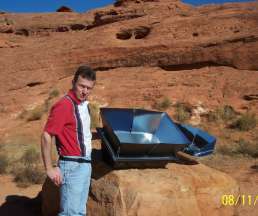 And solar cooking has been proven to be an effective means of cooking as far back as 50 years ago and it is being utilized currently by hundreds of thousands of individuals in the USA, as well as having already been implemented and used on a mass scale in numerous other parts of the world to cook for, and to feed thousands of people on a continual basis each day. 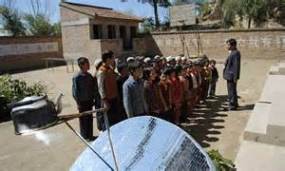 It has been estimated that China already has more than two million solar cookers in use, and it is obvious that they could use a thousand times that amount for its population. China has put over thirty years of development into solar cookers and into the application of this effective method of cooking; nevertheless it finds itself in need of greater implementation of such efforts among such a large population. The USA can do as well in a similar endeavor, if not better. A second populous country, India, has a giant solar kitchen that feeds 35, 000 meals a day and is home to manufacturers that produce thousands of very high quality solar cookers, and they as well find themselves needing even more solar cookers for such a large and disadvantaged population. Here in the USA we can do the same, on a commercial scale as well as an individual scale. We feel that, here in the USA, if we will set a practical example for the rest of the world, by continuing to use and develop solar cooker technology on a larger scale, we can affect a greater and much faster acceptance and application of this green technology in other countries where the need is vital. 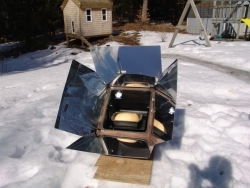 Here in the United States we are more capable of implementing a solar cooker usage program because of our higher per capital income and our advanced economic infrastructure as opposed to most third world countries that do not have the same means. This objective is highly feasible because solar cookers are already a low cost, entry-level means of tapping into the solar powered energy market in comparison to some of the other more costly methods of solar energy use and energy generation. · Better Prepare for Emergency and disaster situations in our communities and our homes by being more ready and able to handle emergency and disaster situational needs for cooking food and purifying water. 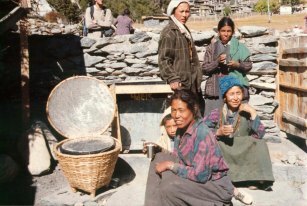 · Combat Poverty and Disease by helping the poorer and more destitute people around the world, and in our own country, by using solar cookers and by subsidizing into other countries the same. All of this could be accomplished through a simple yet effective cooking apparatus in the form of a solar cooker. Imagine five million homes reducing their energy consumption with this alternative means of cooking by using the power of the sun. (There are 112,362,848 households in the USA and if each household used just 2 Kwh per month nationwide, this single act alone consumes 224, 725, 696 (million) Kwh’s of electricity) This requires over 120,000 tons of coal to generate that one hour of electricity used for baking. So how would only five million solar cookers make an energy saving and pollution reducing difference among a population the size of ours? Wouldn’t we need 112 million solar cookers to make a real difference? Admittedly, we do need countless more solar cookers, but we can start with a modest initial goal of five million, coupled with an educational program about the benefits of solar cooking. That is where we have to start, along with reasons and incentives to adopt this unique way of cooking in order to help conserve our finite energy resources. The second compelling reason to have an alternative means of cooking is to have a readily available cooking apparatus that is not dependent on the gas or electric grid in times of emergency or disaster. Some of our own clients and customers have reported to us of having been without electricity for as long as eight weeks or more after a major disaster, compelling them to expend all of their stored in reserve cooking and heating fuels long before they had power restored to their homes. Imagine: Five million household solar cookers available and functioning during times of emergency or disaster helping to alleviate the burden and the resources of government and local emergency responders. Solar cookers can fulfill the same role as an electric or gas cooking device in times of need without the necessity of relying on scarce or nonexistent fuels. Using a solar cooker when the sun is shining will help us to extend the life of our limited cooking fuels for those periods when there is no sunshine, for when there is a real need. As solar cooking organizations we are also helping the poor and needy around the world by contributing knowledge and solar cookers. The third reason for using solar cookers is a philanthropic and humanitarian one, and five million solar cookers being used regularly by people in the United States can directly and indirectly benefit the poorest and the neediest around the world. 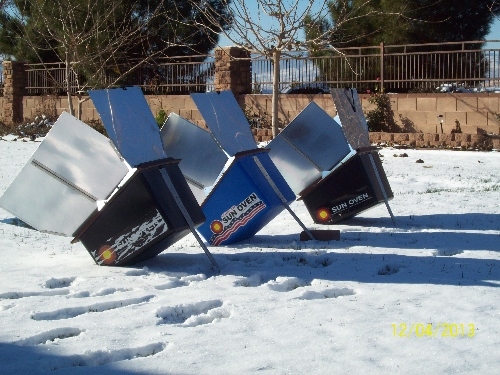 With each solar cooker purchased and used by a US citizen, it will make it possible to subsidize the cost of putting additional solar cookers into third world cities, villages and homes. And, by acquiring and using these solar cookers here we also begin to establish an active and practical example that can be duplicated easily by other countries, thus we are taking the lead and implementing a program that others may be inspired to follow because of our influential example. 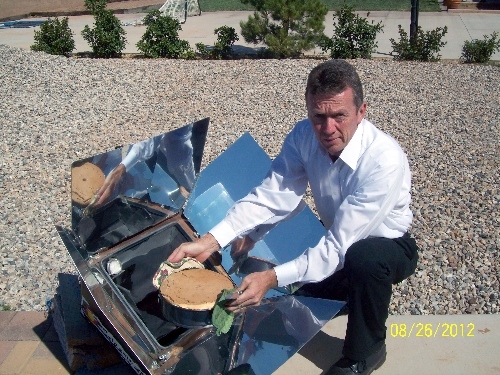 Around the world there are a substantial number of organizations, both for profit and non-profit, who promote solar cooking in poorer countries for the most needy people. People whose circumstances and incomes are insufficient to provide healthy and subsistence lifestyles, much less the basic necessities for survival, are helped immensely by these charitable solar cooking organizations. In some of the poorest countries, such as Bangladesh, Somalia, Haiti, Philippines, much of Africa, and elsewhere there is a great need for economical, efficient and reliable alternative cooking methods, and such a need is vital to the survival of many of the world’s poorest. 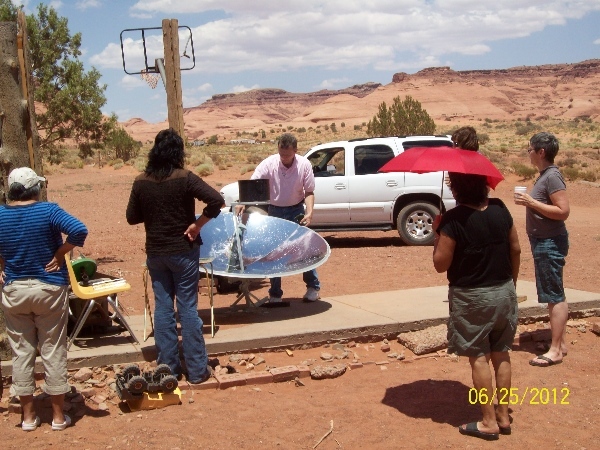 Even within our own United States there are individuals and families who live in relatively similar conditions that would also benefit from ownership and the use of an energy efficient solar cooker. 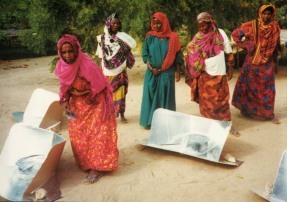 After a deliberate and methodical campaign to educate, with regards to knowledge and education about solar cooking, the American public in the last few years is now gaining a greater awareness and consciousness about solar cookers as more people and organizations are using these unique tools to promote a sustainable and self-reliant way of life. 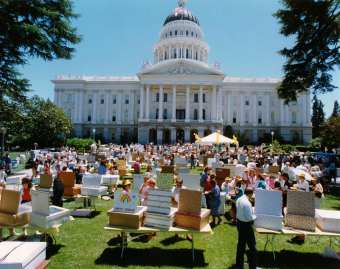 Again, we invite you to join us not only in envisioning the effects around the world, but to participate in this great effort towards using Five Million New Solar Cookers to frequently cook our meals by using the abundant energy of the sun. Come and join our nationwide campaign and participate in a growing movement of individuals and families throughout our country who are using the Free Power of the Sun to solar cook their meals every day. How Feasible is it to reach a goal of Five Million Solar Cookers in Five Years? How would you go about encouraging more people to use solar cookers as a more integral part of their cooking methods? ** If you are an individual, a corporation, or an organization that would like to become a sponsor of our Five Million in Five years campaign, you can contact us for more details and information on this form.